Kurs med Anna Dabrowska aka Finnabair! Da har vi gleden av å presentere kursene som Finnabair skal holde hos oss i april. Hennes egentlige navn er Anna Dabrowska og hun er fra Polen. Kursene holdes på engelsk. Hun er temmelig unik innen for sin sjanger og super kreativ og flink. Hennes kurs er svært populære og kjent for å være fulle av inspirasjon og god hjelp slik at man får fullført prosjektene. Hun designer for flere forskjellige firmaer. 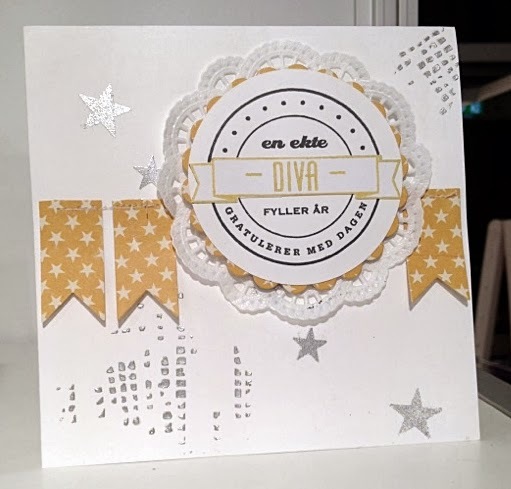 Blant annet Prima og Sizzix. techniques and skills. 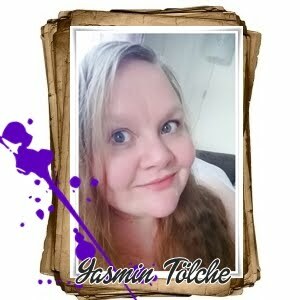 I've been creating since 2007, started scrapbooking in 2008-2009 and mixed-media in 2009 when I got totally addicted. My projects are mostly media-based: I make paper and canvas layouts, collages and altered art, tags, journal pages – and many more. I believe in power of recycling and upcycling and just adore texture, paints of any kind and flea market supplies. Freedom, embracing creativity and being true to your inner voice is my main source of inspiration and creative energy. 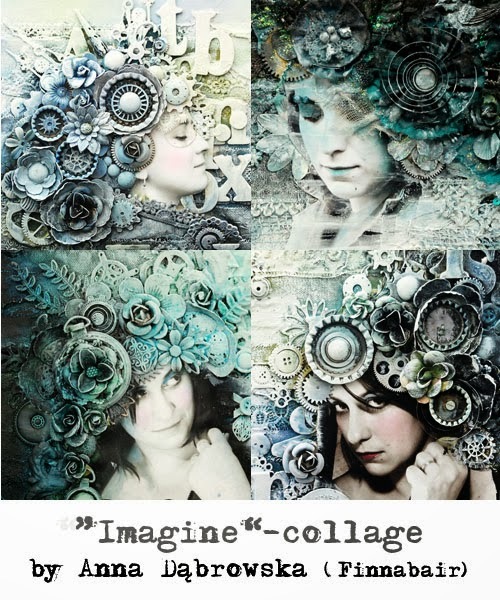 I'm a full time designer and artist and as an experienced traveling teacher I offer a range of my own mixed media-based classes in collage, scrapbooking, art jouraling and more. 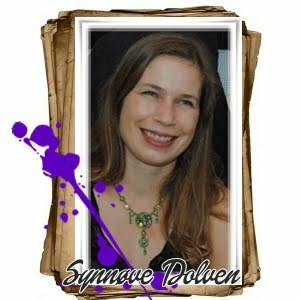 I create as a freelance designer for scrapbooking magazines (from Russia, Sweden, USA, Great Britain, Germany and France) and international shops. 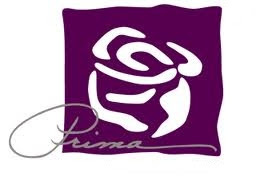 I design projects, products and work with such international brands as Prima Marketing (design team member since 2011 and product designer since 2013), Sizzix UK (design team member since 2012) and 7 Dots Studio (product designer since 2011). In the end of 2013 I've also opened with my husband European online store - Mixed Media Place - dedicated to those of us who fell in love in collage, journals, altering and anuthing mixed-media based! Greeting cards are the best way of expressing our feelings, ending wishes and personal messages to people we love, admire or are grateful to. Each card contains a piece of the personality of the person who made it - that makes them so unique and special. During this class I'd like to encourage you to try creating cards my way - with lots of layers, texture, variety of supplies. 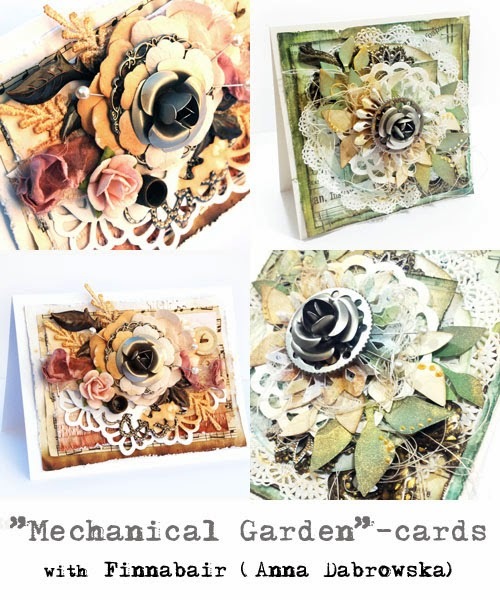 I love to mix beautiful, delicate floral elements with vintage papers and a bit industrial, metal embellishments to create one and only "botanical-mechanical" composition - and so can you! 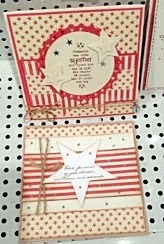 I will guide you step-by-step through he process of creating 2 inspiring, 3D cards based on my products from Prima Marketing, 7 Dots studio and creative using of Sizzix dies. 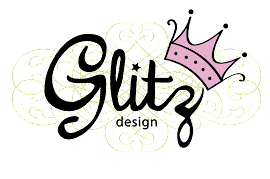 You will play with various techniques such as distressing, inking, layering, spraying - all in one to get the richness of elements and look which will be suitable for both masculine and feminine projects. Mixed-media shadowbox class with lots of techniques including gel mediums, inks, paint and more! Great fun with found objects and pure creativity. During this workshop I’ll try to convince you that beauty can be found everywhere – and it is waiting to be discovered. 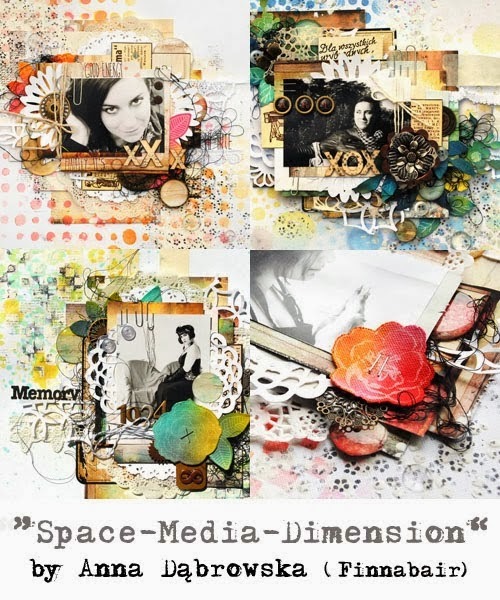 I’ll guide you to create your own mixed-media shadowbox, based on my favorite layering techniques and choice of embellishments, colored with a wide range of color products. 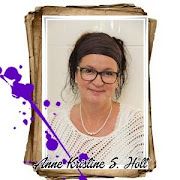 I’ll demonstrate possibilities of mixing different medias like gel mediums, paint, ink, scrapbooking supplies and found objects toget interesting layers and details on the unique grungy project. 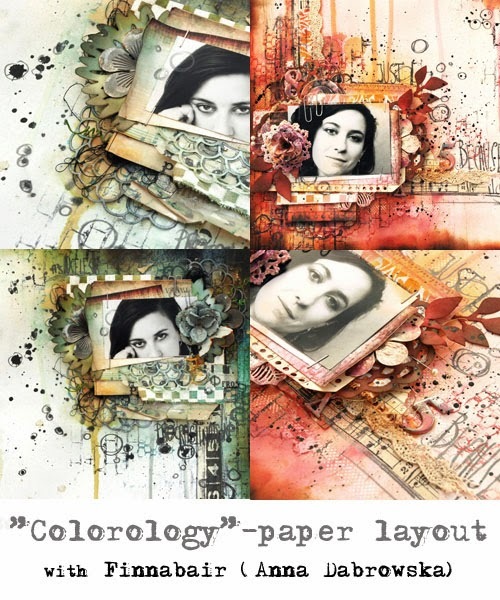 "Colorology" - Mixed-media Paper Layout class focused on creative using of color mediums, stamps and adhesives to build rich, multi-layered, detailed compositions. Do you ant to create really artsy, dimensional nad grungy collage, but you don’t have “suitable supplies?” That is not a problem! The most important thing in creative proces is using imagination. 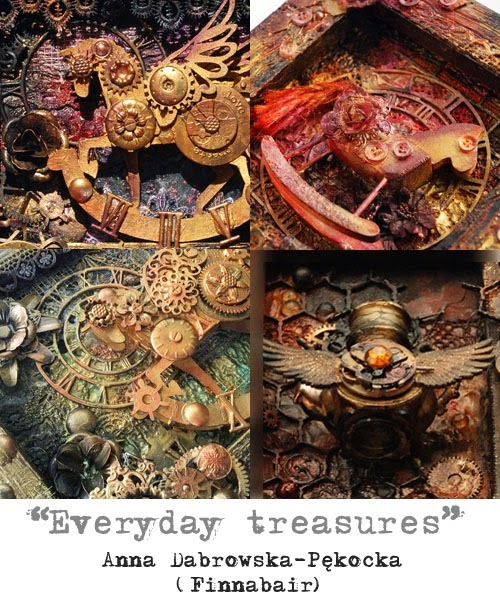 We are surrounded by inspiring objects, which we can use for creating art of different kinds. Try to look around – and you’ll find real treasures in your own house! Remember there are no boundaries: you may give as much or as little elements as you want, you may use medias, paint and inks…and whatever comes to your mind too! Don’t be afraid to mix and blend and let your imagination free – it is pure fun! During this workshop I will guide you to create your own mixed-media canvas, including my favorite set of embellishments and textures, colored with my favorite paints and mixed-media products. 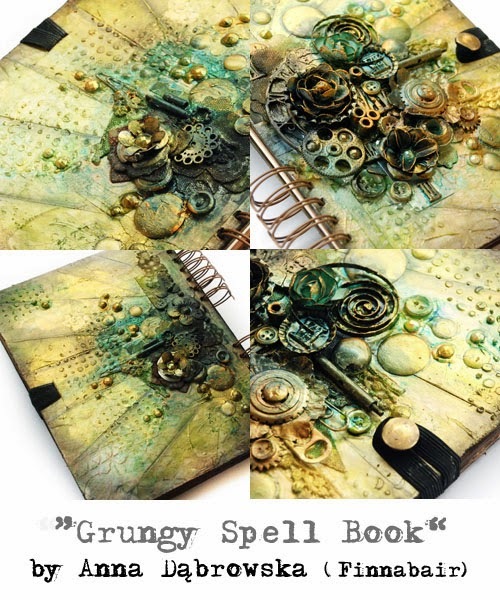 I’ll demonstrate possibilities of mixing different supplies such as gesso, gel medium, spray paint, scrapbooking embellishments and found objects to get layers, details and unique, grungy look on your project. 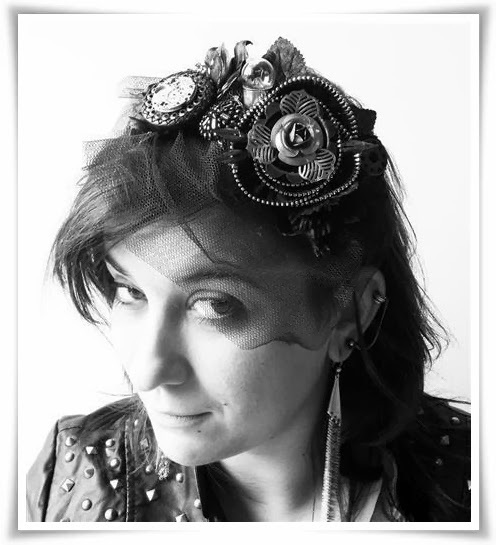 This workshop is suitable for beginners and advanced students (really!) – let’s get our fingers dirty together! Journals are not only about pages – altering the cover of the book is an important part of the creative process, making the frame, closing (or opening?) the composition. Cover should reflect the owners emotions and personality as well as the book's content – which is a great reason to try some inspiring techniques and create something unique, magical and 100% fun. During this class I'll tell you about my ideas for journaling, and share my ideas how to alter a raw journal to get appealing and durable mixed media cover based on a bunch of my favorite techniques such as creating texture with gels and stencils, grungy embellishments and found objects and painting. I'll show you different effect you can get using media such as acrylic paint together with multipurpose glues or varnish. After the class you will have your own art journal which will reflect your taste and a big dose of inspiration: I'll do my best to share my experience, give tips and I'll try to convince you to leave traditional, conventional thinking and go more bold and artsy. It is possible you will be surprised what you can do with medias and tools which you already have in your kit or at home! During this full-lenght class I'll share with you some of my journal projects and a bunch of my favorite techniques based on using masks, stamps, embossing and layering. Together we will create different texturized background gathering information about using such mediums as heavy gel, gesso, pigments, sprays and embossing powder. We will focus on techniques useful both for journalers and scrapbookers tips and non-conventional ideas such as using thread or tea builiding 3 double, technique-packed pages- all with a touch of grungy, artsy style. This class is one big creative, messy fun! You may be surprised what you can do with the supplies you probably already know... or you never thought about before... Let yourself play and think outside the box – why not? 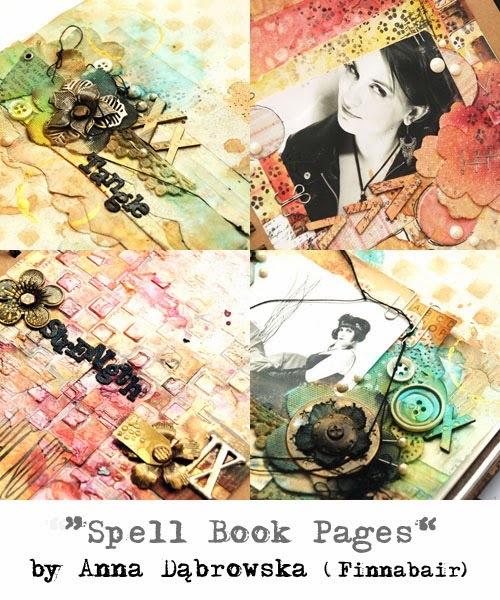 Are you a bit bored with traditional, organized and embellishment – filled scrapbook pages? How about a small change... customized backgrounds, lots of negative space, freestyle artsy look? Feel the freedom of creating, be more adventurous and play with techniques taken straight from the art-journal and adapted for scrapbooking page. Don't miss the chance and joint he fun! 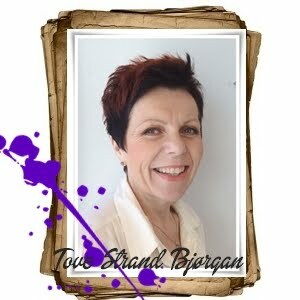 Tove inspirerer oss igjen med et herlig kaffekort med en mal funnet i ett trykk nr6. 2013. Dette kortet passer godt å få brukt opp litt restepapir man har liggende. :) Eller en god unnskylding til å kjøpe seg noen nye. Nydelig dekorert med blomster fra Prima og Wild Orchid. 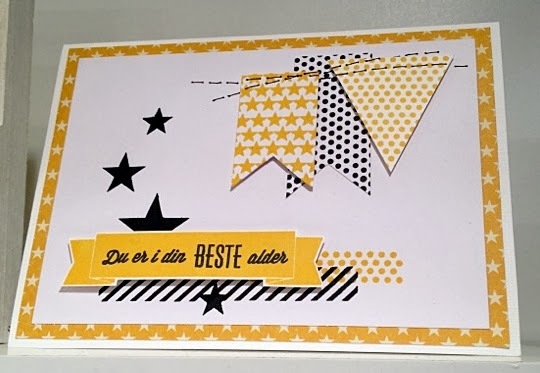 Papiret er fra Papirdesign. Stemplet på dette kortet er fra Kaboks. Arket er fra FlairDesign. En ny uke med nye muligheter! Tove har et herlig damekort til inspirasjon i dag! Tove har brukt begunder rød Bazzill som bakgrunn, mønsterark fra My Minds Eye og Graphic 45. Ta en titt på den flotte gratulerer teksten på innsiden av kortet. Den er stanset ut ved hjelp av kaboks dies Gratulerer med skygge. Disse er å få kjøpt i vår nettbutikk. Stemplet er fra Kort & Godt. 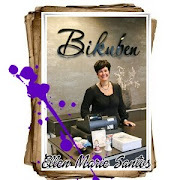 Blonden øverst på kortet er stanset ut med en Tim Holtz alterations dies - on the egde. Utrolig søte ting ikke sant? Anne i nettbutikken har dekorert disse supersøte flaskene med hjertepiler! Så enkelt og så flott, morsom gave til liten og stor. Ta en titt på dette nydelige hjertekortet laget av Danijela! Fantastiske detaljer!! Hva med å brette masse bokser og fylle de med godsaker? Det har Ellen gjort, pyntet med perler og diverse kjærlighets sitater. Disse kan lages av mønsterark som kartong! Tove har laget dette utrolig vakre vintage inspirerte kortet! Det finnes ikke mangel på detaljer på dette kortet. Tove har brukt dies fra både memorybox samt magnolia på dette kortet! Lekkert Lekkert! Kunne du tenke deg å lage noen valentines kort, eller bare gi en romantisk hilsen til noen du er gla i? Det er ikke forseint å svinge innom butikken i dag eller i morgen og lage en liten hilsen. Butikken stenger kl 17.00 i dag og er åpent fra 10.00 - 15.00 i morgen lørdag. Tøffe kort fra Kort og Godt! på messa som var, tok noen kjappe bilder for å vise dere!